For a change of course this past season, two members of the Racing Team ran in the Aloha Turkey Roundup at Arroyo Verde Park. Part of the SOAR Trail Running Series, the Roundup helped raise awareness for SOAR – a local non-profit dedicated to stopping urban sprawl in Ventura County. A portion of the proceeds went to support SOAR’s work. The dirt trail course consisted of two laps through the main park, then a lap through the back trails, chock full of ascents and descents. The equalizer was a climb up “The Wall”, ascending over 700 feet to a crest, followed by a fast downhill toward the finish. Awaiting the finishers after crossing the line? Pancake breakfast provided by sponsor Aloha Steakhouse. 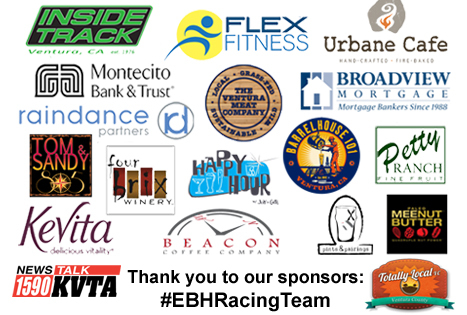 Gallery | This entry was posted in EBH Racing and tagged 2013 Running, 8k Run, Arroyo Verde, EBH Racing Team, Running, Trail Run. Bookmark the permalink.